Many clubs have celebrated a special charter anniversary this year, but none more so than the Norfolk Island Club. This one was special because on this isolated island jewel in the Pacific, the 6 members of Quota International of Norfolk Island see few fellow Quotarians – but they keep the flag flying and provide great support to their community of 2,300. This support was reciprocated when the club celebrated its 35th Anniversary on August 15th. 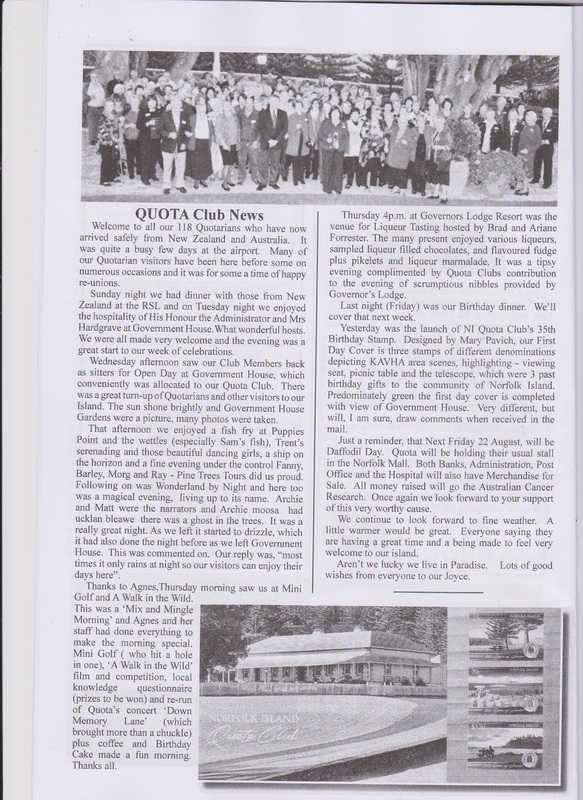 Club President Maureen and her members invited Quotarians from every club in Australia and New Zealand to attend their party. Much to their delight, 118 members, partners and friends from 24 Quota clubs accepted! The New Zealanders arrived on the weekly flight on Sunday; the Sydney group flew in on Monday and the final 88 from Brisbane arrived on Tuesday – and the party began. The activities began with an invitation to Government House for a special welcome from His Honour the Administrator, the Honourable Gary Hardgrave and his wife Lorraine – and what a welcome it was! Government House is sited in the original convict area of the island and on a balmy evening in a picturesque setting, the members greeted friends and made new ones – ready for a week of parties, fun, exploration and shopping. The Administrator urged everyone to spend up – the Island needed the economy, and we did just that! The Island shops sell the exotic – kilts from Scotland, Murano glass from Italy, shoes from Germany, jackets from Norway and everything in between – and not to forget the restaurants! On a small island where the food has to be either produced on the island or imported at a huge cost, the menus are magic! The Birthday celebration dinner on August 15th was graced by 140 guests including the Administrator, his wife Lorraine and her mother Thelma who was visiting the Island. The “heavies” were welcomed back to Norfolk – Past Governor Phyl Meredith now aged 91 was determined to be there to celebrate the club she organized, Past Governor Peg Whittaker, the Charter Governor in 1979 and PIP Beris Pritchard – all of whom have visited the Island many times over the years. On this visit, they were joined by International President Karen Murphy and Region 13 Director Alison Lingard. 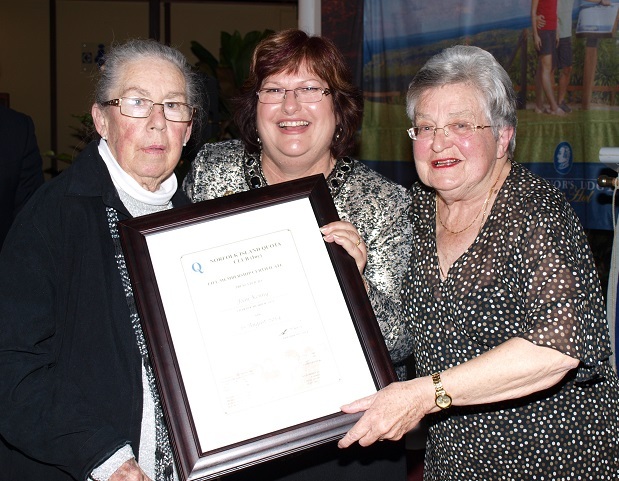 A highlight of the dinner was the presentation of Life Membership to the two Norfolk Island Club Charter members, Joyce Dyer-Lodge and Joan Kenny. 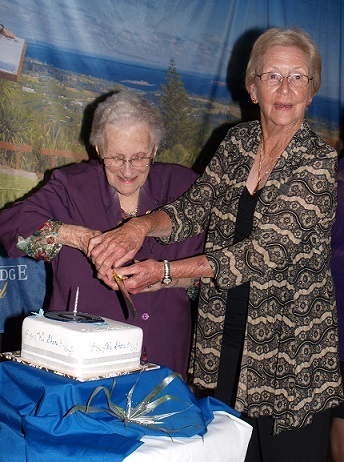 It was a wonderful party, concluded by Peg and Phyl cutting the 35th Birthday Cake. – and a special church service on Sunday night in the beautiful St. Barnabus Mission Church. Our group packed the church. The New Testament lessons were read by Quota’s International President Karen and PIP Beris and the sermon related the connection to the Pitcairn Anthem – an important part of the Island’s history. The sermon was preached by the Honourable David Buffet, the Speaker of the Norfolk Legislative Assembly and a very good friend to Quota International of Norfolk Island since its Charter 35 years ago. The week’s activities allowed the visitors to appreciate the 35 years of community service which has been done by this small club. The community spirit and support from members and business made our visit an outstanding success. To end the week, the Administrator’s wife, Mrs. Lorraine Hardgrave and her mother, Thelma, along with all of the Norfolk members come to the airport for each departure to say “goodbye.” We all considered their generosity a great demonstration of support and friendship. The Norfolk Island club now has three new enthusiastic members, only one month old, and I know there will be more saying “Can we join too”? The 40th Anniversary happens in five years – same time; same place! “Click here” to read more in the Norfolk Island News. In addition to being known for issuing the world’s first Quota postage stamp, Quota International of Norfolk Island has been serving the deaf and hard-of-hearing and disadvantaged women and children on their island since 1979. From providing tsunami assistance including gathering donations for “Housewife Kits” and funding relief efforts, to providing airfare for a young man to receive hearing testing, to supporting the Norfolk Island Public Library with books and DVDs, and the Norfolk Island Central School with a computer, printer, and DVD recorder; the members of Quota International of Norfolk Island have a long history of providing much needed support in their community. A HUGE CONGRATULATIONS to the Norfolk Island Quota Club!!! My husband, now deceased, spent some time on the Island while in the US Navy during World War II as a radio operator. Pictures taken of the island during his time there are certainly much different than the ones you show today! Thank you for the article on North Folk Island, our President Kerrie Oxlade gave a glowing report to QI Liverpool of the tour and celebrations. Great report Beris, seems that a pre/post convention tour to North Folk Island would be an incentive for me and perhaps many to attend 2016 Convention!